I'd like to congratulate Mimi on winning my November Giveaway! I have sent you an email Mimi ~ enjoy! I had a fun time sewing row six of Lori's row along. When I was finished I noticed that the pink gingham cup was screaming for detail so I appliqued a rose I cut from a piece of fabric. Now it's my favorite cup! A close second to the rose cup is this pale blue dog and cat print. It is a very old piece from my stash, but I love it! I wish I had more. I'm not even sure what it is. I adore any print that looks vintagey! 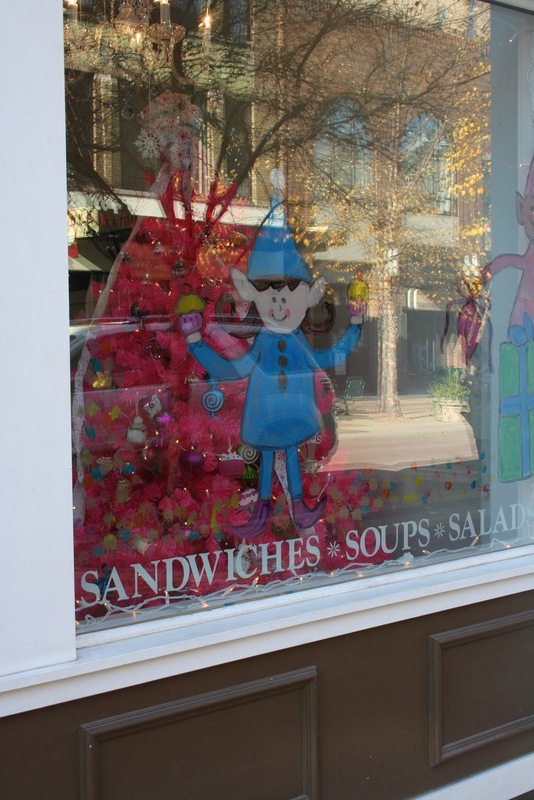 The last couple of days have been spent getting the cafe windows ready for Christmas. I painted these little elves on the windows and I like how they came out. Our orange elf looks like he is hanging an ornament on the tree. My Mom has painted the windows in her home ever since I was little. After she drew the design on, she would let my brothers and I paint a small part of the window. I thought about those windows a lot as I was drawing the elves. In case you were wondering, the tree is really that bright! It is covered in cupcake ornaments that Nancy has collected as well as been gifted with over the past few years. We are getting quite a reaction from customers. The children love it! Wishing you a day that is merry and bright! Love your little elves too - so quaint. Pretty cups. That flower made the cup perfect. Love the evles and the pink tree is perfect for the shop. Great job. Oh my goodness! I love the tea cups so much. I want to make them now too. 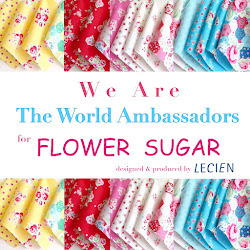 I will go over to visit Lori and see about joining in with the sew along. You and Mom have such talent, The little elves are so happy and adorable. To be able to paint is such a gift! I can't even draw a stick man. What's lovely display. The elves are so cute. What a wonderful and unique memory! 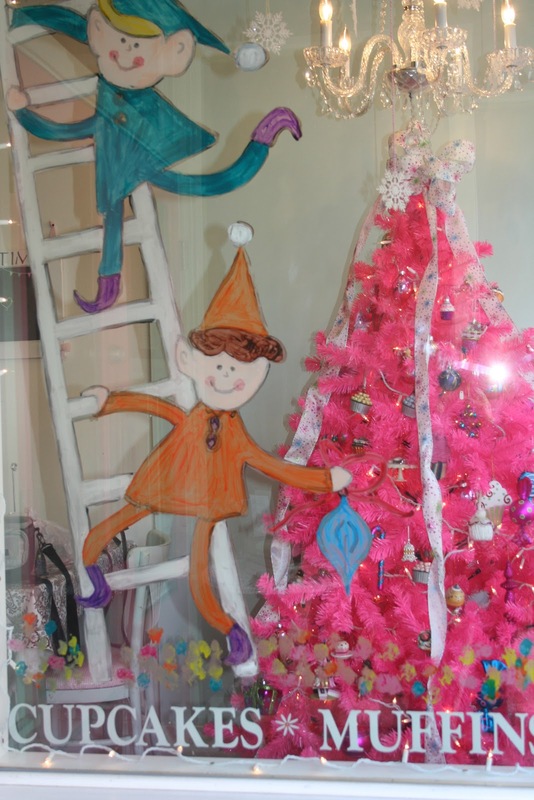 Your elves are adorable...you must have inherited mom's painting talent! Yay!!! I love scraps and the book looks awesome too! Thanks for the thrill!! Congrats to Mimi! Lucky girl. 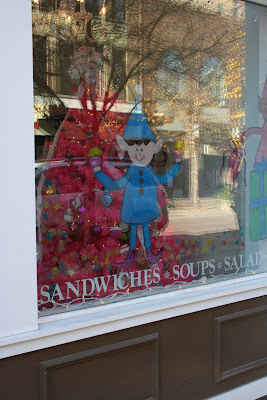 Your shop windows are adorable. Looks like such a fun place to come get a bite to eat. Cups are darling, too. I love the tea(coffee for me) cups. Every week I'm wishing more and more that I could join in. You have another talent...drawing and painting. Those elves are so cute. 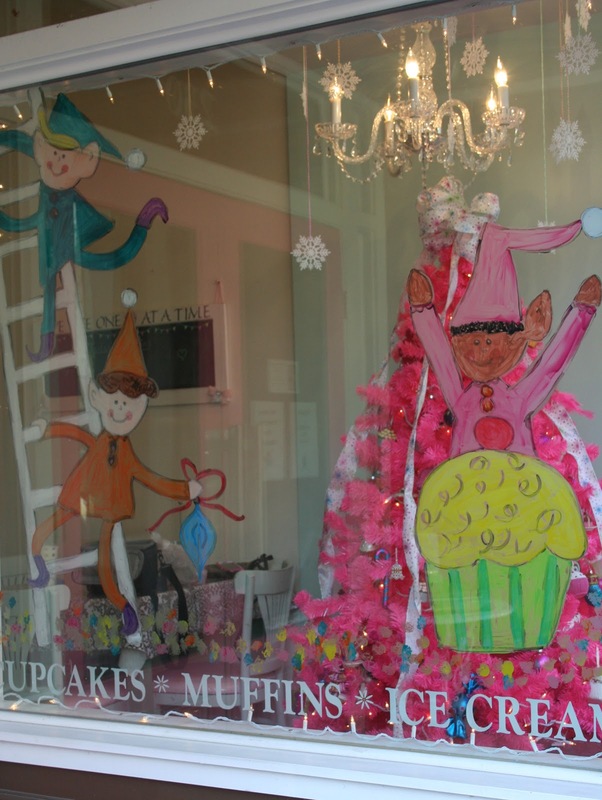 That bright pink tree with cupcake ornaments is so perfect for the shop. How fun! !